The new Department of Musical Creativity and the Environment was established in 2002 to train individuals capable of contributing to the evolution of new musical art forms for the 21st century and to the musical and cultural environments in which these works will flourish. In programs called “Projects,” students integrate the knowledge and skills they have acquired into an imaginative whole. Through experience in Projects, students encounter new possibilities for artistic expression, as well as participate in practical activities that aim to create musical and cultural environments, gaining awareness of their own special talents and interests through these processes. Plans also call for joint creative work across the boundaries between departments and faculties, as well as cooperative efforts with local communities and off-campus organizations. Today’s society needs individuals capable of applying sensibilities, knowledge, and expressive techniques that transcend the boundaries of various disciplines and fields of artistic endeavor, from a humanistic perspective. Graduates from this department will be prepared to launch active careers across a wide swath of society through involvement in various media, companies, research and educational institutions, government agencies, and nonprofit organizations, among other areas, as well as artistic achievement and management. Faculty: The core of the organized curriculum focuses on “projects” which are practical training classes that aim to nurture the study of adjacent disciplines in a cross-disciplinary manner. The educational courses and subject classes include subjects that enable the learning of the fundamentals of music and encourage students to focus on both theory and practice via the study of musical and acoustic works, recording and sound, acoustic psychology, performing arts, the theories of film and media, fine arts, cultural studies, and the theory of management of fine arts. Faculty: The Bachelor’s degree is awarded once students have demonstrated a comprehensive understanding of various fields in culture, society, and science through the study of subject classes established in the curriculum. They would have acquired a high level of specialization necessary to embody the cross-disciplinary ideas in their creative work and research. The department features five studios, each assigned its own area of specialization. In work based on individually chosen Projects, students develop diverse values and sensibilities while learning the fundamentals of music theory. In addition, while the program does not provide full-fledged practical training in artistic fields adjacent to the field of music, students do learn new methodologies and historical concepts and consider various nodes of expression from the perspectives of both the creator and the audience. They also gain fundamental knowledge and real-world approaches to various cultural contexts and gain experience with actual art management. To integrate these various areas, students take part in a wide range of activities, including practical training in media and technology, audio experience in studios and concert halls, and content creation. 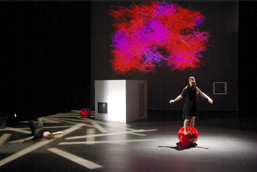 Typical classes address music and technology, cultural environmental theory, introduction to recording technologies, physical art theory, and cultural studies, all taught by full-time faculty. Projects are divided into practical seminars in one of five different areas. Each student selects one of these. In the Project chosen, the student identifies his or her own area of expertise, then works to deepen understanding and knowledge across a wide range of other fields by attending other classes and programs of exercises. Students are permitted to select a different Project in their second and third years. Students can also attend classes in special basic topics, foreign languages, educational subjects, and practical techniques for their minor subjects at the Ueno Campus. Each December, second- and third-year students plan the Senju Art Path program, which is open to the public. This program is intended to provide experience with the ins and outs of exhibiting work to the public and with event management. Students present thesis projects at the end of the fourth year. Following graduation, students have been employed across a wide range of areas, including at NHK (audio design, reporter for NHK Kochi); TIS (systems consultant); Specified Nonprofit Corporation Ku Na’uka Theatre Company (stage performance); music production companies; the Japan Foundation for Regional Art Activities; art museums (Naoshima Fukutake Art Museum Foundation); and the Sai-no-Kuni Saitama Arts Theater. 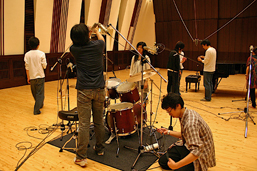 Graduates choosing to continue their studies have gone on to pursue advanced studies in the university’s Department of Musicology and Music Studies (Creativity of Music and Sound/Creativity of Arts and the Environment) as well as the graduate schools of the University of Tokyo, Yokohama National University, and the Institute of Advanced Media Arts and Sciences (IAMAS). Numerous graduates have also advanced to other institutions, including overseas universities. The department actively seeks out international students.